The Summer Giveaway Hop has begun. We thank Kathy from I Am A Reader, Not A Writer and Mary from Bookhounds for hosting. 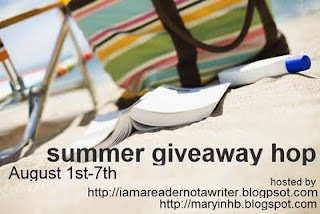 Reader Girls is offering one reader their choice of a summer read (an adult or YA title with a summer theme) or a $10 Amazon gift card. Our giveaway is open to US/Canada. There are over 170 blogs participating in this hop which ends at midnight on August 7th. To see the complete list of blogs in this hop, click here. most from my huge "wish" list. :) Hope you are having a great summer filled with many wonderful books.